When you are composing or reading an email from a contact, how would you like to have their whole social profile at your fingertips? 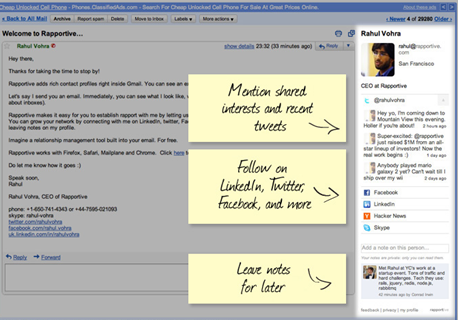 Rapportive is a web solution that replaces the ad column in Gmail with a rich contact profile. 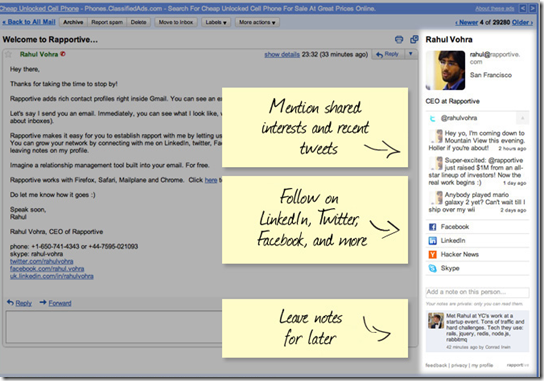 Rapportive is available as an add-on for Firefox, Google Chrome, Safari and Mailplane app. If you have tried Xobni for Microsoft Outlook, Rapportive does the same for Gmail. The extension works by checking the email address of the person you are looking at with publicly available social network presences, pictures. You can find what your contacts are upto in the social networks, connect with them in more meaningful ways and even add notes about them that will appear with their profile everytime. After using it for a day, I found a few of my friends on Flickr which I never knew before, found a few contacts on Linked In, and some in Facebook and Twitter. I can’t believe I didn’t have this before in my Gmail! I highly recommend trying out Rapportive right away!